"There are no heroes and villains in life," Massaro, the titular merchant of Venice, adds. "Everybody's much deeper than that." Shylock (Cooper Rosen) hears his sentence during the trial scene in the Children's Shakespeare Theatre Company's production of William Shakespeare's The Merchant of Venice. Photo by Diana Green, Children's Shakespeare Theatre. Why is she keeping the Old Gobbo scene? I wonder while watching the Diana Green–helmed production of William Shakespeare's The Merchant of Venice at the Children's Shakespeare Theatre. Liam Rigney has just done a marvelously funny performance of Launcelot Gobbo's fiend-versus-conscience soliloquy, and now Alex Barsanti, wearing a blindfold, enters as Launcelot's "sand-blind" father. "I will try confusions with him," Launcelot tells the audience, and then proceeds to bully his dad, physically twisting him around as he gives him nonsensical directions to Shylock's house and then—"Mark me now, now I will raise the waters," Launcelot tells the audience—proclaiming that Launcelot has died. It's not funny. After Launcelot reveals himself, though, the still-crying Old Gobbo doesn't believe he's really his son; now that's funny. These are kids staging this play, the Knaves of the Children's Shakespeare Theatre (CST), the troupe for kids ages 8–14 (another troupe, the Rogues, is for 14- to 18-year-olds). This abuse of a man with visual impairments is not something we should be teaching them as comic. You don't need to stop me right there; I stop myself. This is The Merchant of Venice we're talking about. It hits me while watching this scene, especially in a production by grade school and middle school kids, that Shakespeare didn't merely write an anti-Semitic or an anti-anti-Semitic play or a play about racism specifically or generally: he wrote a play about bullying, across racial and ethnic divides, across economic divides, across generational divides, and across divides of physical abilities and impairments. And he wrote it as a comedy. Is this a play children should be exposed to, let alone performing, and in a generally hilarious staging at that? Absolutely: These actors see racism, rising numbers of hate crimes, and bullying every day through newscasts, on the Internet, in their communities, and, no doubt, at their schools. During a talkback with the entire cast after the play, when 10-year-old Hela Giaever, who plays Jessica, Shylock's daughter, says, "You need to know someone's backstory before you judge them," she's expressing a truism in and about this play that most adults just don't grasp. On that profound observation (who says children aren't qualified to have social and political opinions?) let's first address a prejudice attached to this production, what to many might seem an anomaly in the company's name, Children's Shakespeare Theatre. 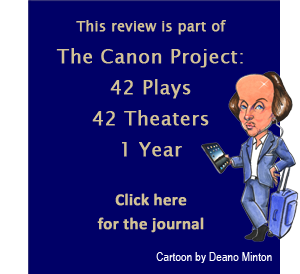 This is my third review of a CST production (As You Like It in 2016, Queen Lear in 2017), and in those essays I've discussed how, yes, kids can understand and act Shakespeare on par with adults. These are not professional actors, but their grasp of Shakespeare's language and verse structure, thanks to Green's teaching, is better than that of many professional actors, and a couple of performances this night I rate as top tier among the 19 stage productions of Merchant I've attended. I return to CST for nothing other than the quality of performances and the insights I glean from these actors performing Shakespeare plays under Green's direction. For instance, for the first time I notice just how much bullying goes on in The Merchant of Venice, which Green sets in modern times, costuming the characters in hip Italian fashions while Portia (Journee Benjamin) wears a different gorgeous dress for each of her scenes (except when she's disguised as the judge). Many audiences and readers focus solely on how Antonio bullies Shylock (the Jew describes it, Antonio shows it); but when Shylock gets the economic and legal upper hand, he bullies Antonio. The various Christians bully Shylock, but they also bully each other, starting with the opening scene when Salarino and Solanio hound Antonio to reveal why he is so sad. 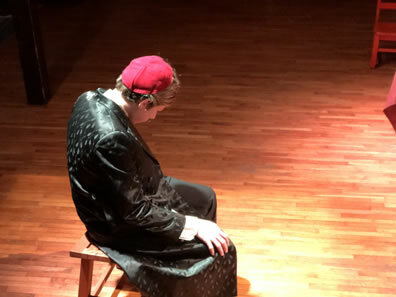 Gratiano is usually singled out for his vile behavior toward Shylock in the trial scene, but from his first appearance his gregariousness is intended to overwhelm even his friends. "I must be one of these same dumb wise men, for Gratiano never lets me speak," Lorenzo says. Lorenzo, meanwhile, bullies Launcelot, then Bassanio's servant, who, while Shylock's servant, assisted in Lorenzo and Jessica eloping. All the suitors are, by Portia's description, bullies; they apparently don't want to play by the rules of her courtship—per her father's will, suitors must choose among caskets of gold, silver, and lead to find her portrait in order to win her as wife—and they depart when she doesn't relent to their demands. Portia, herself, isn't as merciful as she preaches in her famous speech about the quality of mercy. She may be playing the role of judge when she condemns Shylock, but in that disguise, her badgering Bassanio into giving her her ring and, then as herself, nagging Bassanio for parting with her ring is bullying. 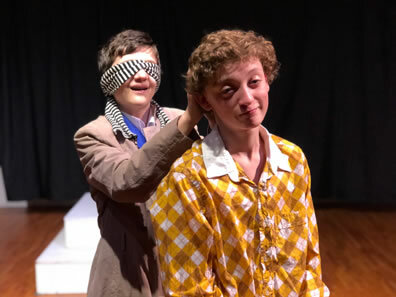 Critics highlight the many parent-child relationships in the play (another valid reason to keep the Old Gobbo scene, I concede), but I'm noting in this production how these relationships also fit into this discussion on bullying, one generation over another. Portia's father bullies her from beyond the grave by decreeing in his will that she can only be married through the test of the caskets. "Your father was ever virtuous," Nerissa says, and, indeed, in the end he secured her romantic choice. But Portia, rightly, casts herself as victim. "I may neither choose who I would nor refuse who I dislike, so is the will of a living daughter curbed by the will of a dead father." The Gobbos represent the younger generation bullying the older, and the bullying cuts both ways in the relationship between Shylock and Jessica. By her testimony, she lives a hard life at home, and we see him order her to not only lock the doors but keep shut in the house during the masque. Most productions play Jessica as a sweet innocent or a victim herself, but when she elopes with Lorenzo, she victimizes her father by out-and-out robbing him and then recklessly spending all his money, including using the ring he had "of Leah when I was a bachelor" to buy a monkey. Cooper Rosen, playing Shylock, brings tremendous meaning to his single line about the ring by subtly looking down at his ringless hand. You wonder if, before he left for the dinner with the Christians, he had placed it in the casket that Jessica stole that night. Whether through Green's direction or the actors' own interpretations, this staging of Merchant is full of such subtle but meaningful moments that build to a fulfilling appreciation of the play's plot and thematic arcs. Gratiano (Adam Greenberg) has warning in his eyes when Antonio (Cole Massaro) urges Bassanio (Ethan Lee) to give up the ring the judge (Portia in disguise) asked of him as recompense for securing Antonio's freedom from Shylock's bond. Greenberg's Gratiano is so unwilling to carry the ring to the judge that Lee's Bassanio barks, "Away, make haste!" (with that add-on command, Shakespeare indicates Gratiano is hesitant, yet I don't recall ever seeing it played this way before). This fuels Gratiano's irritation when, having given up his ring to the judge's clerk (Nerissa in disguise), he gets called out for it by Nerissa (Claire Carroll). Gratiano and Nerissa become a couple when Bassanio courts Portia, and they announce their own intentions to marry when Bassanio wins the casket challenge. On the other side of the stage Rigney's Launcelot wonders in gesture if that means he's supposed to marry Balthazar (Josie Rothman), who quickly gestures a rebuttal. Upon reading the inscription on the lead casket, Who chooseth me must give and hazard all he hath, "Must give, for what? For lead! Hazard for lead? This casket threatens; men that hazard all do it in hope of fair advantages. A golden mind stoops not to shows of dross." "Shall I think in silver she's immured, being ten times undervalued to tried gold? O sinful thought! Never so rich a gem was set in worse than gold." And when he picks wrong (he picks the gold, of course), he departs abruptly: "Portia, adieu, I have too grieved a heart to take a tedious leave. Thus losers part." 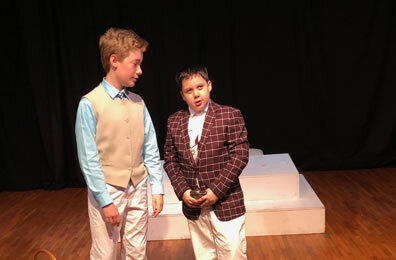 Top, Gratiano (Adam Greenberg, right) asks to accompany Bassanio (Ethan Lee) to Belmont in the Children's Shakespeare Theatre's production of William Shakespeare's The Merchant of Venice. Above, "sand-blind" Old Gobbo (Alex Barsanti) is surprised to discover "what a beard hast thou got" on his son, Launcelot (Liam Rigney). Photos by Diana Green, Children's Shakespeare Theatre. In this and in other ways, Green expands on the comic foundation of the play. We actually see the suitors of Portia's descriptions in the first Belmont scene (Shakespeare keeps them offstage): the stereotyped visuals of Portia's stereotyped descriptions are funny, though it's embarrassing to admit that (which is the point). The production's biggest stars are the entourages that accompany Morocco (in gold and silver t-shirts and baseball caps, dancing and partying with THE Prince) and Arragon (black shirts and silver sashes to match the prince's glittering silver dinner jacket). Jasper Macri speaks in an overly passionate accent mixing French, Spanish, Italian, and spoiled brat while his crew fawns over him with "sí, sí, sí" or "nooooh" as he ponders each chest. When he picks wrong, they all depart in a crying group hug. Even Bassanio has something of an entourage with his entrance to Belmont as Launcelot and Gratiano stroll in swaying to the R&B groove of Anita Baker's "Sweet Love." Rigney is consistently funny in each of Launcelot's scenes (and scores a big laugh as the English suitor), but he also effectively establishes the context to his resisting Lorenzo lording over him in the Belmont scenes. Lee as Bassanio combines the natural charm of a gleaming eye and easy smile with exquisite verse-speaking ability, from his meditative stillness while delivering his casket-choosing speech to his laugh-achieving description of Gratiano: "Gratiano speaks an infinite deal of [pause] nothing." Regarding Gratiano, Greenberg's performance is stunning for an actor of any age. From the moment he first walks on stage and starts a close inspection of Antonio's fashion and bearing—"You look not well, Signor Antonio. … Believe me, you are marvelously changed"—to his delivery of the play's last line—"While I live I'll fear no other thing so sore as keeping safe Nerissa's ring," which he then drops as the lights go out—Greenberg creates a near-constant laugh track. In the trial scene, he actually generates empathy for Gratiano even as he bates Shylock. I've seen some well-acted Gratianos, but I've never actually enjoyed the character before, and all credit for the uncomfortable realization that I like this Gratiano goes to Greenberg's acting skills. Rosen anchors his portrayal of Shylock on one word: his "bond." Having lost his daughter and with that daughter much of his wealth, and having incurred his own debt because of the "bankrupt" Antonio (Shylock uses the word twice as a noun to describe Antonio) the bond for a pound of Antonio's flesh and his home is all he has left. His grief and outlook he twists into the malice that now feeds his revenge. "I'll have my bond, speak not against my bond," he says, Rosen in every instance giving the word bond the force of a Muhammad Ali punch. By doing so, Rosen pounds the word into our subconscious. Bond. Though he's using the word as a legal document governing a loan, this play features various types of bonds: bonds of love (the rings) and duty (the caskets), and the bonds that bind all members of a society into a successfully functioning community, which is integral to Venice's city charter that serves as a subtext to the trial scene. Antonio and Shylock both violate that bond. While we come away with fond memories of the comedy, we don't come to a clear sense of right or wrong in this staging of The Merchant of Venice. This might seem odd or, at least, a missed opportunity in 2018, the age of Trump, and in the hands of children. But Shakespeare doesn't draw clear lines of right or wrong with this play; he's merely reporting on humanity as it is. It's up to us to learn the backstories, including our own: then we can have our bond.